New from Injinji for winter 2014 is the SNOW, a new product within their Performance 2.0 line of socks. I love seeing that, as Injinji continues to grow, they continue to expand their product line to include socks that are much more specific to a purpose or activity versus having a few multi-purpose variations. By going the route of specialization, they can ensure that their socks provide the best comfort and protection for all of the specific activities that we do. The SNOW is a perfect example of how they are branching out. The SNOW provides the right combination of warmth, cushioning, and performance for any of your winter endeavors. 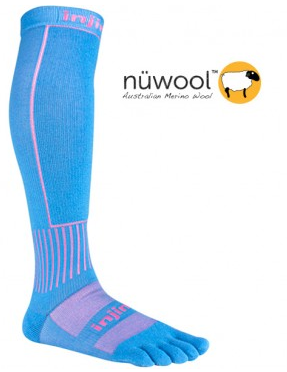 It uses Injinji’s nuwool, which is their unique wool blend. It combines that with a well padded foot and OTC (over the calf) graduated compression design meant to improve blood flow and performance in your legs. I love wearing the Outdoor as an everyday sock in the colder months, so considering that the SNOW have a similar feel, I was not surprised that they too were very cozy and soft. They aren’t as tight and restrictive as the regular Compression line, but still offers much of the endurance and recovery benefits of OTC compression. These were so comfortable that I even found myself leaving them on for most of the day after I was done snowshoeing. They provided ample cushioning, from under the foot to the top of the sock, to keep your legs protected from obstacles and the elements. I wore regular (non-insulated) trail shoes with these while snowshoeing and my feet stayed pretty warm for the most part. One of my big toes was starting to get a bit cold, but warmed up as soon as I started moving a bit faster. With insulated footwear, such as a ski boot or winter hiking boots, your feet would definitely remain nice and warm throughout your activity. There was a good balance here. My feet did not get sweaty at all while at the same time, they weren’t so breathable that they let cold air in to my feet. Even wearing them around the house afterward, my feet remained at a constant, comfortable temperature. This one is hard to tell because Utah has the “best snow on earth”. In other words, it is powdery and dry versus wet and sloppy. My feet were not wet and neither were the socks after I was done snowshoeing. However, if they are truly like the Outdoor line (which is my impression), then you shouldn’t experience any more issues with these than you would any other wool blend sock. In fact, Injinji’s wool blend often outperforms many other wool blends from what I have seen. The SNOW is the perfect blend of warmth and compression that will keep your legs fresh for hours of activity. At $30, these are less expensive than most compression and in line with many OTC ski socks. This would be a good addition to your cold weather apparel, whether your ski, snowshoe, hike, or run in the winter months. For extra warmth and protection, you may even pair them with the Injinji sock liner if that is your thing. I will likely find myself also using these as a winter post-activity recovery sock. This entry was posted in Gear Reviews and tagged Accessories, compression, footwear, gear review, Injinji, product review, running, shoes, ski, skiing, snowshoe, snowshoeing, socks, trail running, ultra running, ultrarunning, winter by Ultrarunner Joe. Bookmark the permalink.